The 102H/W wet tissue machine is a very simple to operate and simple to set up machine. 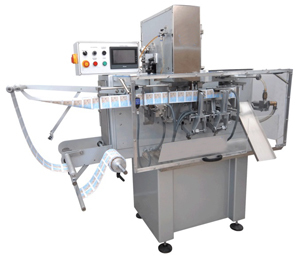 The sachet size range that the base machine produces, is 60mm x 80mm, up to 110mm x 120mm, with speeds up to 70 sachets per minute, from a flat roll of film. The sachet can be either 3 or 4 sided as required. There is a liquid injection system that can deliver up to 8cc of liquid in each sachet. The tissue is a nominal 200mm wide and is folded through its length 5 times. Before being folded again and loaded in to the sachet. The machine can fold the length of the tissue once or twice, as required. A perfect machine for airline wipes, medical swabs, makeup removal, lady care wipes, baby wipes or just refreshing tissue.